Pennisetum macrourum (African Feather Grass) is a tussock-forming grass, that is native to South Africa, but has naturalised in Australia and New Zealand. Its leaves are pale green on the surface with a silvery underside. In summer, clumps produce long, thin, bristly flower spikes resembling rats' tails. These start off a pale white and gradually turn to a yellow straw colour. This variety isn't completely hardy and needs a sheltered position with free-draining soil to thrive. If you live in a cold area, grow in large pots and move into a cool greenhouse over the winter months. This is an arching plant that has an ultimate height of 90cm and spread of up to 50cm. It can take 2-3 years to reach its ultimate height. Pennisetum is a genus of ornamental grasses in the family Poaceae, native to both tropical and warm temperate regions of the world. 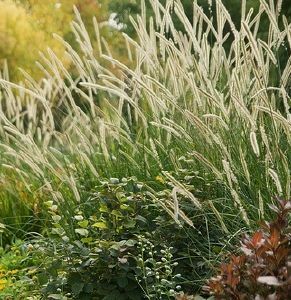 They are large perennial, occasionally annual grasses, growing 1–4 m tall, and are collectively known as Fountain or Feather Grasses. The plant prefers a sheltered situation. Pennisetum macrourum grows in soils ranging from a pH of 6 to 8. It is adapted to clay loam, loam, loamy sand, sandy clay loam and sandy loam soils, and prefers medium fertility. Uses: Architectural, dried flower/fruit, drought resistant, flowering shrub, borders and wild effect or prairie planting.